Directed self-assembly of quantum dots (QDs) is a method to overcome the intrinsic limitations of self-assembled QDs. 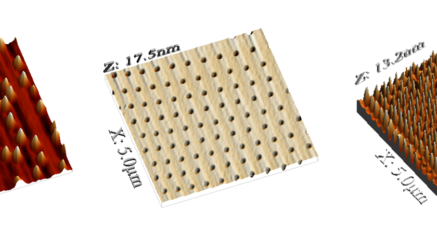 It consists of a combined top-down and bottom-up approach, where self-assembled QD are grown on pre-patterned substrates. This allows for a more uniform size-shape distribution (thus sharper optical emission), while site control grants deterministic position (for integration in nanophotonic devices). Growth of high mobility GaAs/AlGaAs 2D electron gases allows the achievement of conducting channels in which low T electron transport is ballistic over 10s of microns, and the observation of exotic quantum transport phenomena. 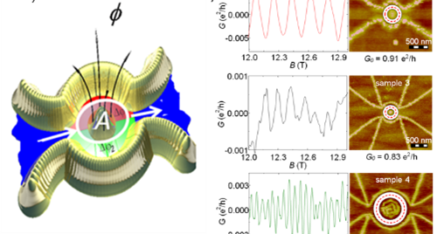 The figure shows an example of a quantum device: a) Schematic representation of a GaAs/AlGaAs quantum ring with flux through the center and the two different phases accumulated in both arms of the ring. 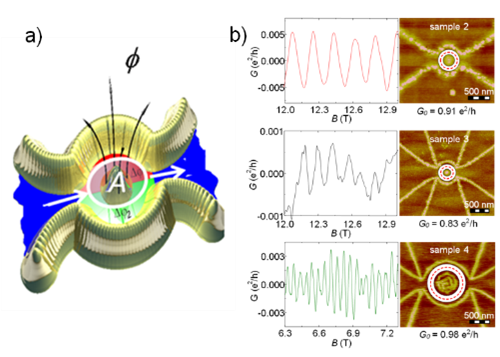 b) AFM images and high-field oscillations of 3 rings (Nature Physics 6, 173 (2010).